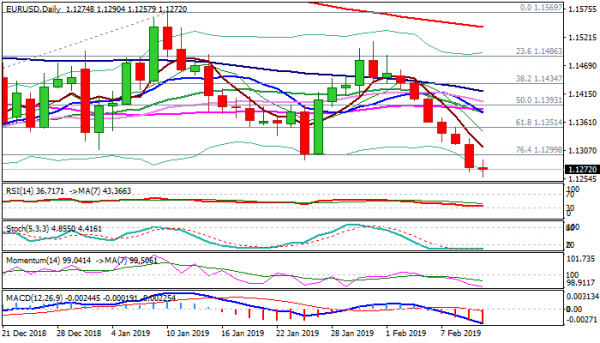 The Euro holds in red for the seventh straight day and hit lowest levels since mid-Nov after eventual clear break below 200WMA on Monday (the pair holds firmly below 200WMA for the first time since Nov 2017) generated strong bearish signal. Break below former lows at 1.1289 (24 Jan), 1.1270 (14 Dec) and 1.1267 (28 Nov) opens way towards key med-term support at 1.1215 (12/13 Nov double-bottom), violation of which would generate another bearish signal on completion of asymmetric H&S pattern on weekly chart. Meanwhile, bears may take a breather before final push towards 1.1215 target as deeply oversold daily stochastic signals adjustment. Upticks are expected to provide better selling opportunities and should be ideally capped by 200WMA (1.1334).